We Release the official version of Kono Email Bot Today! Kono, the AI powered scheduling bot is now open to individual users. The official version is free for trial to anyone who uses Google, G-Suite and Microsoft Office 365 calendar. Konolabs Releases Kono, AI Scheduling Bot That Allows You to Never Check Your Calendar Again San Francisco, CA, September 13, 2017 –(PR.com)– Konolabs (https://kono.ai) announced that its AI powered scheduling bot, Kono, will be available starting today. 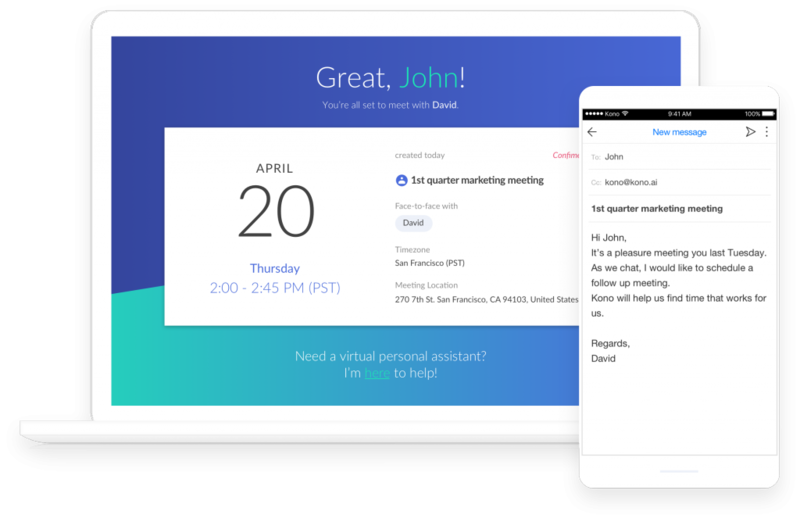 Called Kono, the email-bot comes with an AI engine with machine learning and natural language understanding capabilities. Users write to or copy Kono in their email, and the bot will schedule a meeting based on users’ calendars and preferences. While Kono checks calendars, sends invites, and exchanges emails, users can stay in a single platform and feel focused. When finding a time with the counterpart, Kono suggests time slots from users’ real-time availability. Having no slots pended, Kono captures every meeting opportunity that means a lot for users. The company launched its initial beta version of Kono in July 2016 and ran it in limited region. The official version is free for trial to anyone who uses Google, G-Suite and Microsoft Office 365 calendar. The enterprise version is also available with various pricing plans supporting more calendar systems and providing advanced features for enterprise users. Built with in-house developed, patented technologies, Kono has already received much recognition from enterprises mainly in Korea and Singapore. According to the company, as the company has finalized several POC tests with named companies, it could provide more reliable and secure services for even large corporations. The company plans to attend the AI Expo North America (https://www.ai-expo.net/northamerica/) in coming November to exhibit their solutions and business use cases.